Just in time for the holiday season, Pic the Gift has released their new fully customizable Christmas Tree Skirt. Decorate every inch of this tree skirt with names, designs, or even photos! Just in time for Christmas, Pic the Gift, is announcing a new product to their line of customized photo products. A Christmas Tree Skirt that will make any tree look completely unique and one-of-a-kind. This holiday decor is the perfect Christmas gift that will be cherished for years. The Tree Skirt measures 58" round when finished and has a 5" opening with a rear velcro closure. This personalized tree skirt adds a special touch to the tree, while hiding that unattractive tree stand. They can also act as a catch all for fallen pine needles and ornaments making clean up quick and easy. The tradition of the tree skirt began in Germany where Germans were the first people to begin decorating the Christmas tree by with lit candles and bows. Melting wax from the candles would collect on the floor so for easier cleanup, Christmas tree skirts were created. 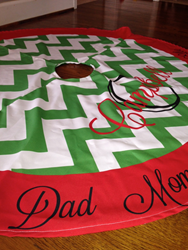 Pic the Gift’s online designer allows the customer to create endless amounts of personalization to the tree skirt! They will have the ability to create their own designs with personal photos or one of Pic the Gift's hundreds of stock designs available. Customers can also upload their own files from their computer, Facebook, or even Instagram and add specials effects to create a truly customized skirt! Pic the Gift’s customizable Christmas Tree Skirt is the perfect family heirloom. Decorate every inch of this tree skirt with names, designs, or even photos. It can be laundered, vibrant colors are permanent and made to last for years to come. Pic the Gift’s biggest goal is making their customers “WOW” by creating unbelievable creative, personal gifts. The company prides themselves on producing high quality personalized products and picture gifts and keeping manufacturing in the USA. For more products and information please visit http://www.picthegift.com/.